We must change our posture and approach when engaging as the church in under resourced neighborhoods. As disciples of Jesus, we readily follow him into service. Some even follow Jesus into his ministry to the “least of these” (Matthew 25:40) — the marginalized of society. But we also must model the posture Jesus used when working with people that needed restoration. Think of Jesus’ life and ministry to the marginalized and how he positioned himself. He went to them, ate with them, walked alongside them, talked with them, sat with them, and listened to them. In everything, he built relationships and conveyed the truth that they belonged with him and he to them. Sometimes, even in the name of serving, people position themselves above or apart from those they serve. Their action is right, but their posture is wrong. They stand in a position of privilege and power. They serve from the other side of the table, and then they leave the neighborhood until it is time to serve again next month, quarter, or year. If you are feeling bad at this point, please don’t! We want to affirm any impulse, especially when compelled by faith, to love neighbors. Just as we must deepen our understanding of scripture, prayer, worship, and other fundamental areas of Christian faith, we also need to grow in our understanding of what it means to serve in the way of Jesus. Put on God's glasses. It is crucial to see neighbors in under resourced neighborhoods as people of infinite worth, not as people of need. They are made in His image and carry inherent dignity, worth, and purpose. Join existing activities. It is tempting to go into neighborhoods, see great needs, and want to start new events or initiatives. But there are already people in the neighborhood who care and are working on solutions! Try joining what they’re already doing in their neighborhood. Come around the table. This has two meanings. (1) If you are serving at a table for some event or service opportunity, don’t stand behind it the whole time. Come around and sit or stand next to people! (2) Always sit around the table with neighbors when eating or discussing. These simple actions help take you beyond a service role and into relationship. Ask lots of questions then actively listen. Neighbors are the experts of their neighborhoods. Asking them questions that allow them to share their expertise with you dramatically changes your position. Then, you have to do the really difficult work of listening without interjecting and placing yourself into the expert position. Repeat presence. Nothing builds trust faster than loving, consistent presence. However, that process is not fast. If you continue to show up and invest with appropriate posture, neighbors will be more likely to open up and receive the love of Christ through you. 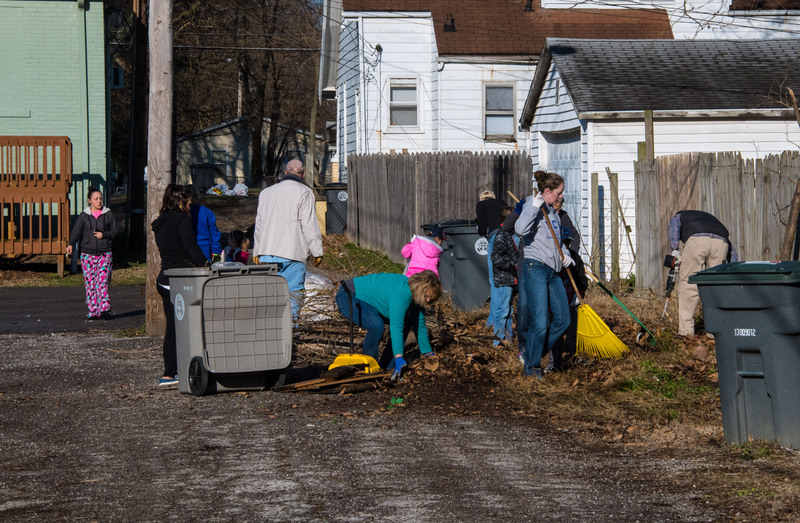 What other ideas, learned practices, and tips can you think of to encourage appropriate posture when engaging in neighborhood revitalization? What are the things that make life enjoyable? If you polled 1,000 people with that question, many consistent themes would likely emerge in their answers. Spending time with family and friends, having good health, doing a job well, having exciting new experiences, eating good food, being able to read and learn, and (most importantly) laughter. A neighborhood Quality of Life Plan takes the question, “What makes life enjoyable?”, from a personal perspective and shifts it to a community perspective. Neighbors identify the strengths, weaknesses, opportunities, and threats of their neighborhood. Then, they dream of what the future would look like when every resident has the opportunity to access all the things that make life enjoyable. All of these ideas are turned into goals and objectives. The Quality of Life Plan is a living document that houses all the neighborhood goals and objectives. It creates focus and alignment behind the shared neighborhood vision. The Tepe Park neighborhood in Evansville went through this process and has a published Quality of Life Plan. It serves as the guidelines for revitalizing their neighborhood, and Community One acts as lead agency alongside them. Learning what creates a high quality of life was not difficult. Staying focused and pushing life resources into these areas to make them abundant is where the real challenge lies! Neighboring, jobs, education, housing, safety, health… Most people in our city take these for granted until they are taken away. For some others, their surrounding environments do not naturally support these basic elements needed for an enjoyable, abundant life. The Quality of Life Plan builds these priorities into neighborhoods. It keeps everyone on track and moving in the same direction. The various goals and objectives encourage people to join in where they are most passionate to create maximum impact in the neighborhood and for neighbors. 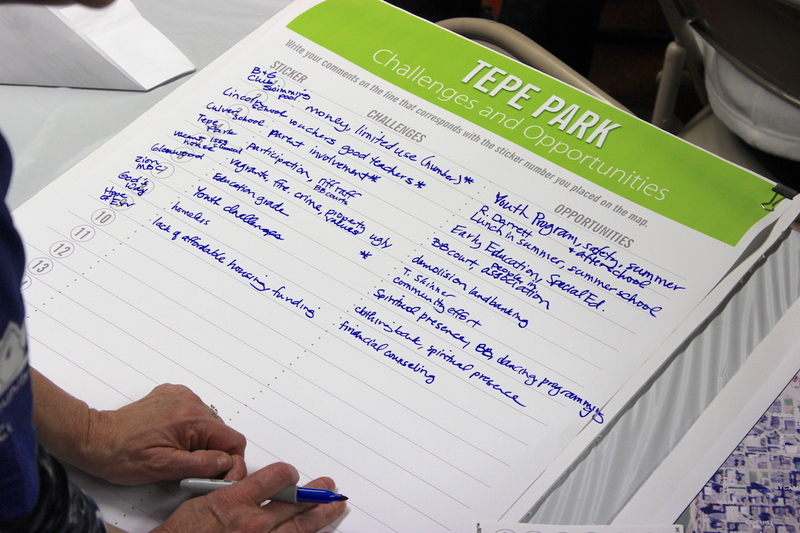 Do you want to learn more about the Tepe Park neighborhood revitalization initiative? Contact Austin Maxheimer at austin.maxheimer@community1.org or 812-250-6888. At a gathering of church leaders in July 2017, Mayor Lloyd Winnecke said the greatest gift churches can give our city is to simply be good neighbors. Can you believe that? For all the services, programs, events, classes, and mission trips churches do in the name of Jesus, our Mayor said if we just loved our neighbors — the one priority Jesus commanded His followers to do after loving God — then Christians could transform Evansville. And the faith community of Evansville has the capacity to do it too! 83% of Evansville residents identify as Christians – 49% as practicing and 25% as highly engaged. Even if only the highly engaged group actively pursued the Great Commandment and loved the eight neighbors physically around their home, the love of Jesus would completely cover the population of Evansville. So why is Jesus’ clear command not executed? It fills an important need for our city, and it clearly aligns with God’s will for His people. Where is the disconnect? The solution must be complex, or we’d have neighboring revolutions all over the place. At Community One, we reduce the complexity of community engagement and mobilize churches into this critical area of mission. The simplest expression of our purpose has always been to love your neighbor. Through restoration of deteriorating housing, and now revitalizing under resourced neighborhoods, the core of what we do has always been creating an opportunity for followers of Jesus to live out the Great Commandment in a real, tangible way. And to ultimately see restoration and hope come into the lives of real people in our community. Neighbor Where You Are – Everyone has neighbors they interact with everyday. This includes co-workers, strangers we pass, and friends we interact with. It also includes our neighbors in physical proximity to our homes. What would it look like to reorient how you view your neighborhood and home? It is more than a place of refuge; it is a launching pad for missional engagement. What would it look like for you to step into obedience and love your actual neighbors? For many of us, this is an anxiety-inducing idea. However, it is also the simplest way to infuse your everyday life with meaning and purpose – to live out your faith in ways we long for as Christians. We can all do this now! We can neighbor where we are today. Neighbor Where We’re Called – God clearly calls His people to care for the marginalized of society throughout the Bible. People who, because of various cultural factors, are deemed “the least of these.” Jesus modeled this with His life and His ministry. There are neighborhoods in our city – full of people – that face significant challenges to experiencing a high quality of life. These areas need restoration and renewed hope. They need the love of God to light up their neighborhood, and they need the Church to answer the call and love them as they love themselves. If Neighboring Where You Are or Neighboring Where We’re Called resonates with you as an individual, a small group, or a church leader, then simply contact us to talk about your unique next step in loving your neighbor. Everybody knows “that side of town” or “that neighborhood.” Some people think these areas should be avoided. However, neighborhood revitalization begins with the belief that people living in challenging areas have inherent dignity and value, deserve access to a quality of life on par with others, and are the solution themselves. Neighborhood revitalization draws out the best of what it means to be a good neighbor and part of a community. Imagine a city where every neighborhood is known for positive energy and strong relationships. Places in which anyone would choose to live, work, worship, and play. While this vision may seem unattainable, we believe it is a vision worth pursuing precisely because of the very real people that live in these neighborhoods. They are people with names, talents, hopes, and dreams. When they are connected and resourced, they have the power and ability to live an abundant life. What a wonderful vision! However, we cannot ignore the reality that revitalizing a neighborhood is difficult and challenging. It is a process that takes years of focused investment to see transformational change. Fortunately, there are methods and best practices in action throughout our country and even in neighborhoods close to us. We can learn, implement, and adjust continually to make the biggest impact and be responsible stewards of the resources entrusted to us. 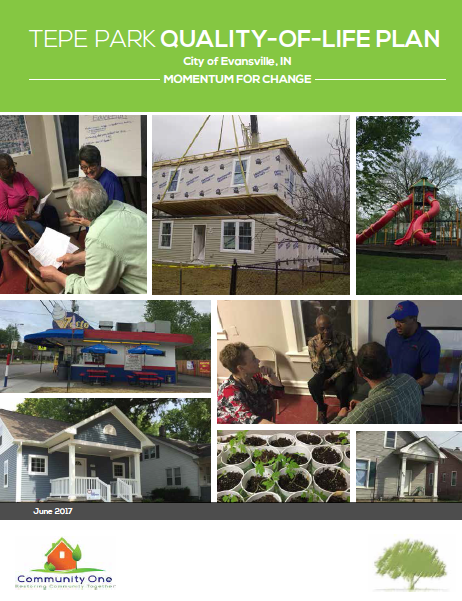 The neighborhood revitalization process made simple is: Listen, Align, Act, Measure, Repeat. Listen – This crucial first step recognizes that residents are the experts of their neighborhood. Based on their collective time, talent, and resources, most wants and needs can be identified by them – when given the opportunity to be heard. Align – After listening, different priorities emerge. Alignment comes when all voices within a community are combined then partner organizations and leaders are brought in to fill gaps. This fundamental step brings unity and focus to neighborhood efforts. Act – Listening and talking is meaningless unless vision becomes reality. Action must happen – both to build the spirits of neighbors in under resourced areas and to bring credibility to the claim that change is within reach. Measure – Failing is criticized too harshly. Failing is acceptable – as long as you measure, adjust, and try again! Measuring is essential to neighborhood revitalization. It tells us if our investments of time, talent, and resources are making the difference we hoped to make. That’s neighborhood revitalization: Listen, Align, Act, Measure, Repeat! Starting with the inherent dignity and value of neighbors, knowing they have the time/talent/resources to bring lasting change to their neighborhood, and bringing in help to cover gaps and build bridges. We hope you will join us in this exciting work of neighborhood revitalization that leads to Neighbors Loved. Community Restored. Hope Renewed. Neighbors loved. Community restored. Hope renewed. As I reflect on Community One's vision, I can't help but see the person and mission of Jesus. Loving our neighbors is one of the greatest commandments given to God's people - second only to loving him fully. Restoring all people in relationship to one another and to God himself was Christ's mission. Love and restoration bring hope! Jesus spoke of hope for an abundant life now as well as a hope-filled eternity with Him. Love, restoration, and hope are all gifts we receive in Jesus Christ. He is the one we celebrate at Christmas, and every day, as we seek to bring these gifts to our city. We thank God for your prayers, support, and partnership. And we wish you a joy-filled and very merry Christmas!